Music Minus One High Voice. 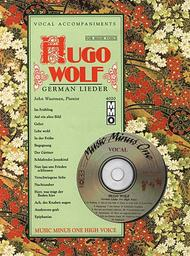 Composed by Hugo Wolf (1860-1903). Sheet music. Music Minus One. Classical. Softcover with CD. 50 pages. Music Minus One #MMO4020. Published by Music Minus One (HL.400466). Hugo Wolf, the tormented artist whose great songs have left a lasting impression on the vocal arts, is here represented by a beautiful collection of Lieder for high voice. Superb music and a rewarding set of songs for any vocalist. Includes a high-quality printed vocal score and a compact disc with stereo accompaniments to each piece minus you, the soloist.